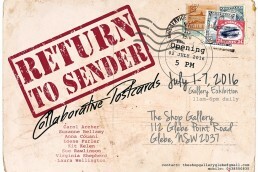 Welcome to Postcards between Friends, an exhibition of extraordinary postcards. They’re real postcards, complete with stamps, postmarks, and wear and tear, but they’re special in three ways. 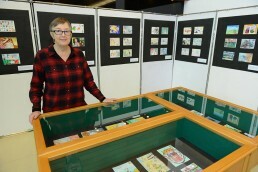 They are all hand-drawn. 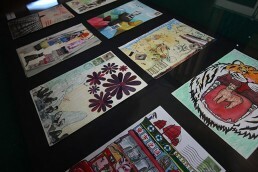 Every postcard is a collaboration between at least two people. And every postcard has been through the mail at least twice. The process works like this. One artist starts a drawing and, without adding any verbal instructions or commentary, mails it to another. 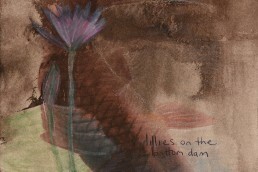 The second artist finds the postcard in her mailbox, completes the drawing, and mails it back to the sender. 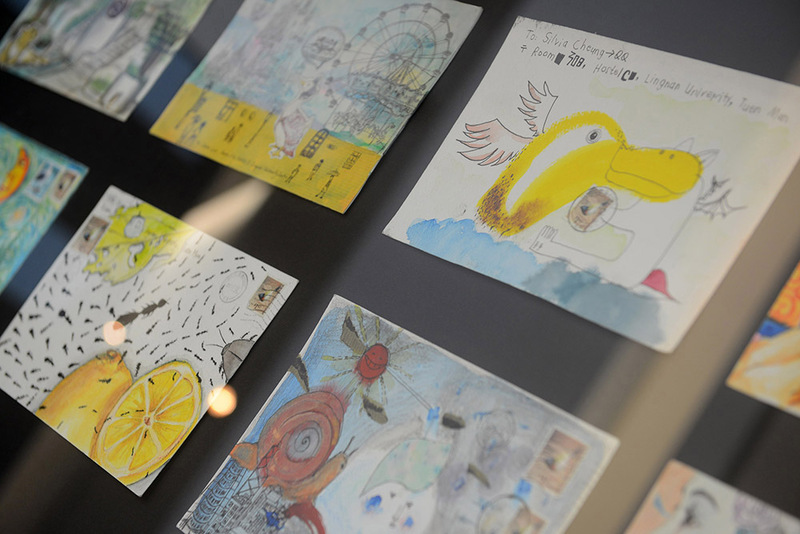 The results are surprising because each collaborative postcard is a small work of art that neither of its makers could have predicted. 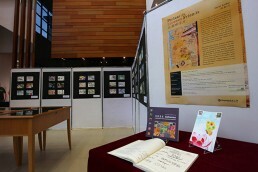 The exhibition of Postcards Between Friends at Fong Sum Wood Library, Lingnan University, Hong Kong)showcases the collaboratively-drawn postcards produced by Carol Archer (Lingnan University) and five artist-friends: Anna Couani, Loene Furler, Kit Kelen, Sue Rawlinson and Virginia Shepherd, along with the postcards made by the eighty-five students who participated in Carol’s drawing classes from 2012 until 2014. As well perusing the exhibited works, visitors can enjoy video screenings that explore the postcard-making process and the learning it involved. 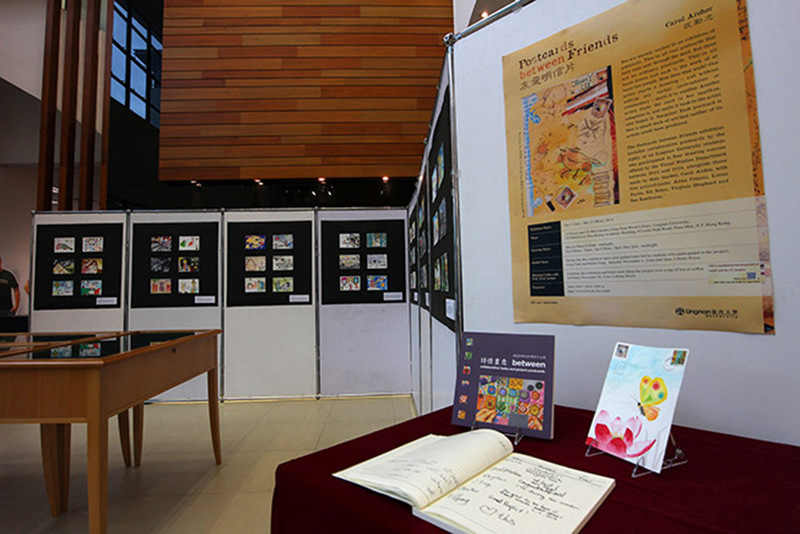 ‘Postcards between Friends’ is an instance of Liberal Arts education at its best. 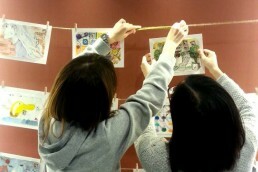 Students have been challenged – intellectually and creatively – through an art-making process that fosters experimentation, mutual generosity and peer learning. A one hundred and eighty page catalogue that explains the project and showcases its results is available in the library from December 12, 2014. 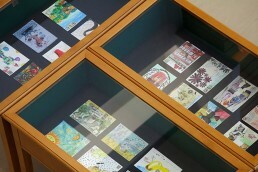 To see the catalogue, click on Postcards between Friends (catalogue). To see a video of students discussing the collaborative postcards they made in response to collaboratively-written haiku written by students studying with Professor Kit Kelen (English Dept, University of Macau), click on Strange Places (video of students discussing the project). 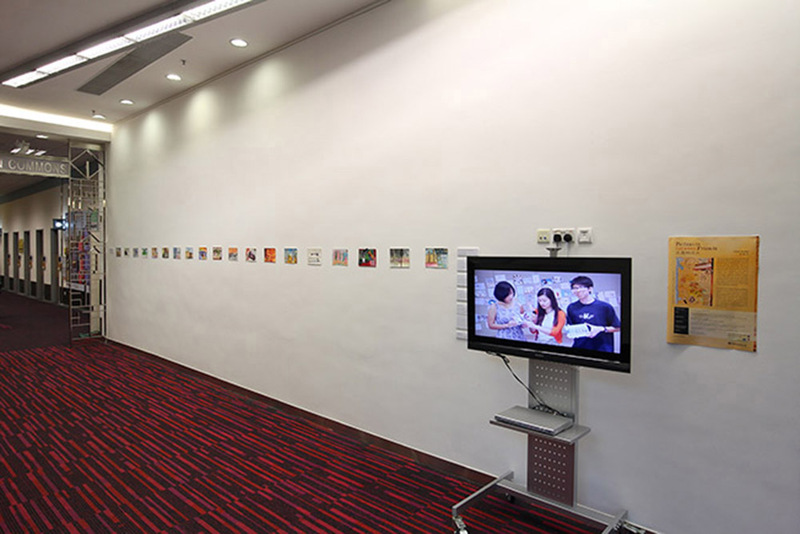 To see a (partly bilingual) video that explains the project as a whole, click on Postcards between Friends (short exhibition video). 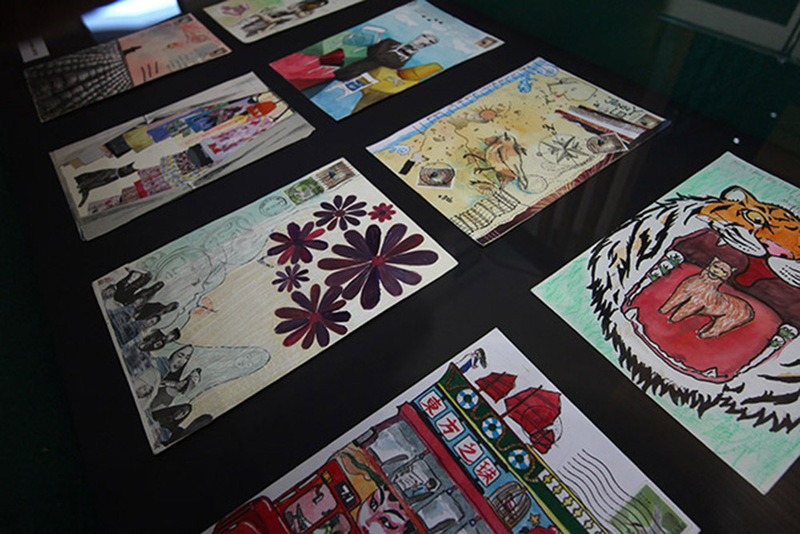 There’s also a blog titled Collaborative Postcarding Hong Kong that showcases scans of most of the postcards made by Carol’s drawing students during 2012 to 2014. 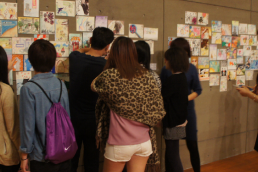 Artists’ names are listed throughout according to the order in which they worked on a particular postcard. 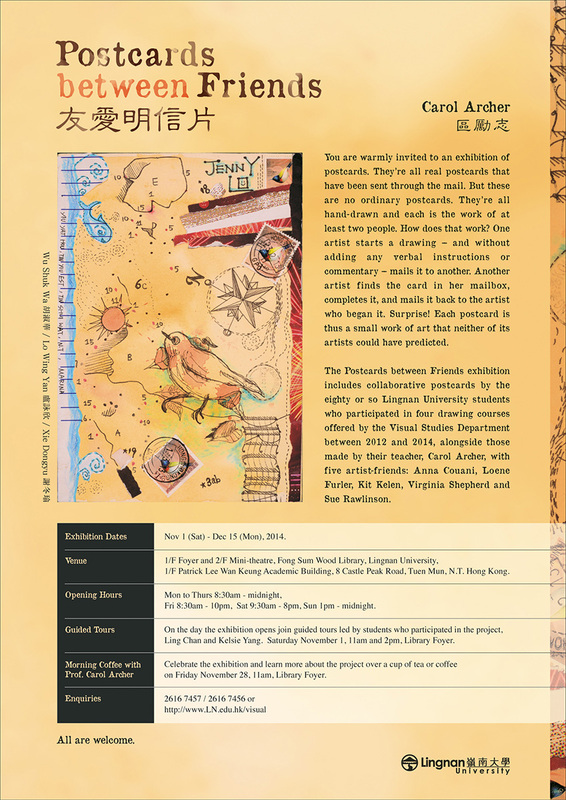 The project is supported by Professor Carol Archer’s Lingnan University Teaching Development Grant [‘Postcards Between Friends: Collaborative Drawing and Creativity Pedagogy’; TG14A1]. 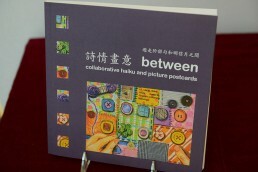 Publication on collaborative postcard/haiku pedagogy, Carol Archer and Kit Kelen.